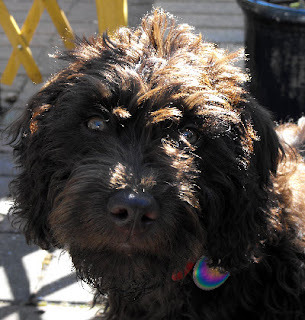 Hello, I am Leo the Labradoodle, doing a guest post. This is the world.. according to me. 1. The human who decided kibble was the most complete nourishment for a dog, is evil. And don't think that disguising it with a meaty topper makes it any better. Cat poo tastes better. I know, I've tried it. 2. On the subject of cats, they are the spawn of the devil. No ifs or buts, the spawn of the devil, I tell you! 3. On the subject of poo, fox poopy smells better than Chanel No5, especially when I've rolled in it. I don't know why they always bath me as soon as we get home. Spoilsports! 4. The human boys in this house are very unpredictable. They insist on picking me up and hauling me around. When I hear them coming, I pretend to be asleep. Sometimes this doesn't work. 5. Wet tissue that I find on the ground is a real delicacy. I have to wolf it down quick before they wrestle if off me. 6. The only time I'm allowed upstairs is when I have to have a bath. I forget this EVERY TIME, until I'm on the landing and it's too late to escape. 7. Good things come in crunchy packets. Chocolate biscuits must be tasty too but I'm never allowed one. 9. I'm not sleeping, I'm thinking about how to get them to give me a chocolate biscuit. 10. Some other boy dogs have round things between their back legs. I'd like to know what happened to mine. Wait...you did WHAT?! !